Play longer and harder without breaking a string! Using a breakthrough polymer technology to provide the sound of vintage steel saddles, but with a kinder, gentler treatment of the strings. Lets you play more aggressively and confidently. For narrow spaced 2-1/16" E to E saddles found on Strat's and Tele's. Utilizing new, breakthrough technology in polymer engineering, you'll never again have to worry about breaking strings. Metal saddles hold your strings firmly. Too firmly. Imagine tightly gripping a wire coat hanger and bending it back and forth, over and over - it snaps. 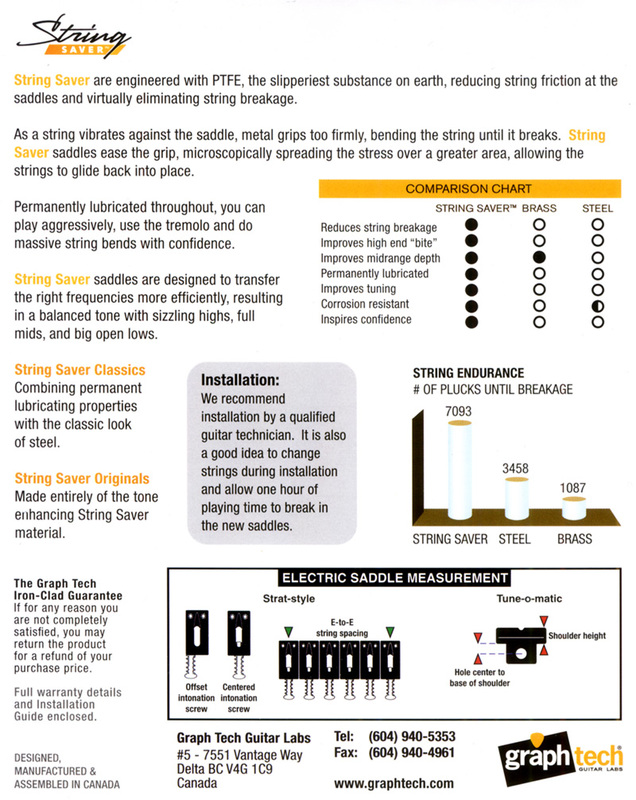 Patented GRAPH TECH STRING SAVER SADDLES ease this grip. As a string moves and vibrates against a String Saver saddle, a thin Teflon™ film is created. Teflon eases the grip of the saddle on the string and microscopically spreads the stress over a greater portion of the string. For string breakage reduction the difference can be dramatic. Strings that last and last, no matter how hard you play. 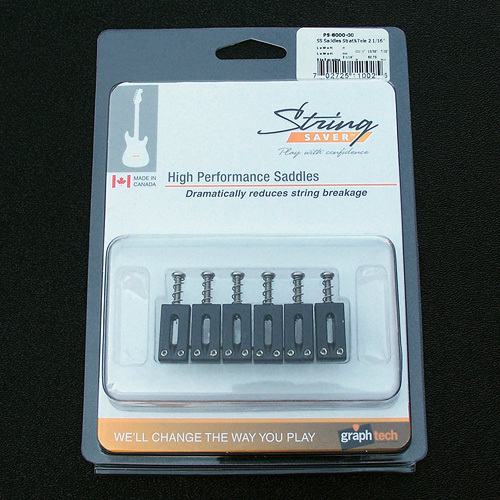 String Savers have the full bodied tone and bite of vintage steel saddles with 25% more sustain than brass! Try them and you’ll see why so many of our customers say String Savers are absolutely the best guitar modification they’ve ever made. Go for those wild bends, play harder and be more aggressive, dare that string to break!